While everyone else is slowly getting back into their work routine furniture, lighting and home accessories manufacturers from all over the world have been working feverishly to present their wares at the first two trade fairs of the year - imm Cologne (January 14-20) or Maison & Objet in Paris (January 18-22) - some even show at both! Atelier François Pouenat at Gallery Joyce with Barrel desk (left) & SchnickSchnack shelves (right), by Parisian studio Pool. Maison & Objet has always come under flack for being too accessories oriented - too decorative. To overcome this criticism last year the organisers moved to make a greater distinction between accessories and furniture and gave each their own area. This certainly makes it easier for those looking for specific items to refine their search and removed the feeling of walking aimlessly about. What is great about Maison & Objet is the mix of price points with a huge spectrum being covered from the highly commercial must have accessory to the limited edition art piece. Like most fairs the action doesn’t all occur at the trade fair itself but at alternative venues around the city. One such event this year was that of metal working company Atelier François Pouenat at Gallery Joyce in the 1st Arrondissement. 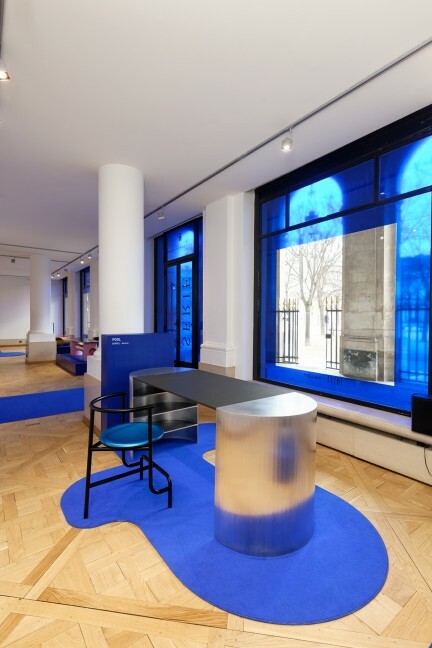 Here the work of designers Paul Loebach, Fredrick Paulsen and Fabien Capello, along with the curators Parisian based POOL studio, were presented in a simple setting on deep blue plinths. 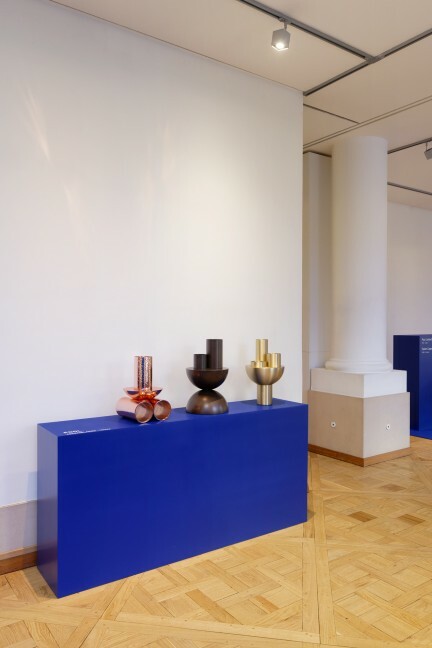 The eight works on show explored new avenues in various metals across furniture and accessories. Fredrik Paulsen’s ‘Ror’ coffee table, part of Atelier Francois Pouenat’s Series 1 exhibition at Joyce Gallery. At the other end of the price spectrum, French company Harto launched several new products during Maison this year including ‘Eustace’, a small bench with optional backrest by Margaux Keller and ‘Josephine’ a marble or oak topped coffee table by Mathieu Galard. The brand creates interesting objects at very reasonable prices - the limitations are around fabric choices as the bench is offered only in three shades of synthetic velvet. French brand Harto launched several new pieces including the ‘Eustache’ bench (left) and ‘Josephine’ coffee table (right), seen here with ‘Charlotte’ mirror by Charlotte Juillard. Portuguese brand Uto - Soulful lighting presented some interesting lights which combined materials like woven cane with polished metals, lacquered colours and opaline glass. 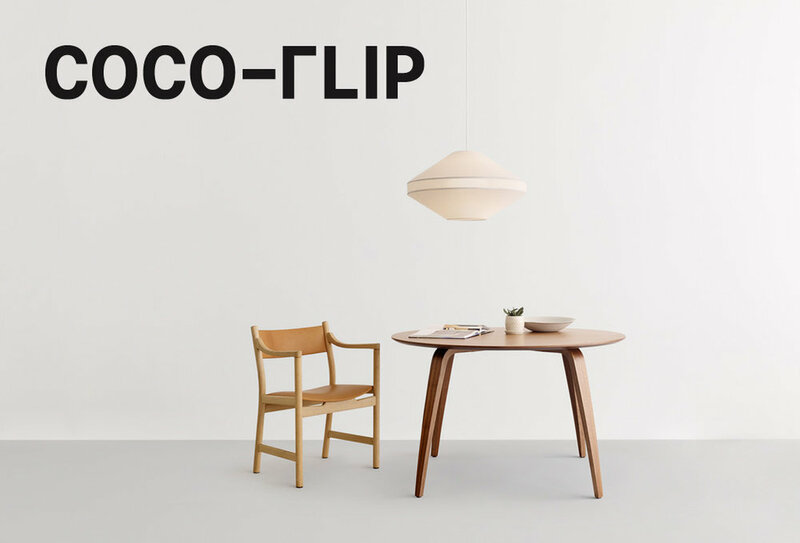 The ‘Monaco’ collection was a standout but their ‘Helio’, ‘Hoop’ and ‘Link’ ranges were also highly appealing. 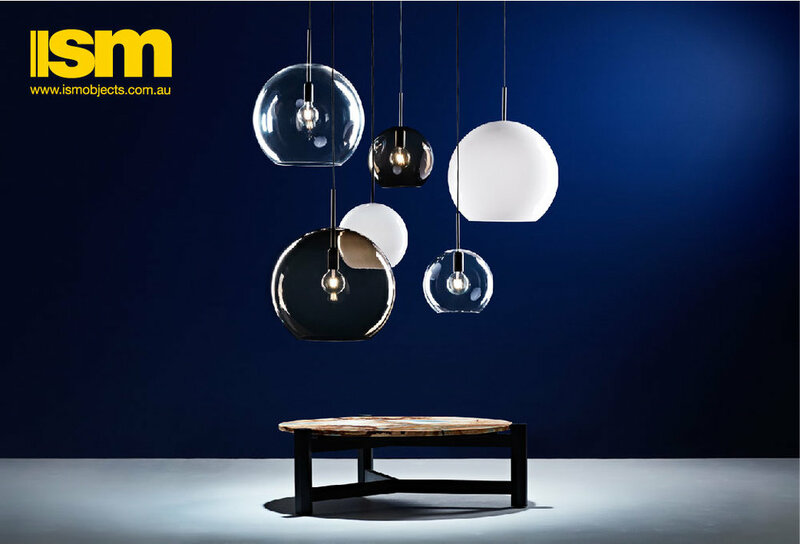 ‘Monaco’ pendant by Portuguese brand Uto - Soulful Lighting. 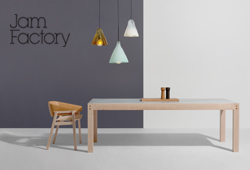 In a pre-Brexit move British brand SCP launched a large number of products with three new rugs from Donna Wilson, a sofa by Dutch designer Piet Hein Eek, a new collection of solid timber furniture including a dining table, bench and side tables by Canadian Philippe Malouin and a coffee table by Matthew Hilton. Philippe Malouin’s Barrel collection for SCP uses solid oak planks to form barrel-like bases across a range of tables. Piet Hein Eek’s sofa ‘Home’ for SCP, shown here in Kvadrat Canvas fabric. Donna Wilson Blue Lines rug for SCP. Donna Wilson Sea Pebble rug for SCP. Donna Wilson Waves Ovals rug for SCP. German designer Sebastian Herkner was chosen as Designer of the Year for Maison & Objet January 2019 and as a consequence was asked to create an exhibition which outlined his studio’s work to date and explained the ethos of his practice. While it may seem that Herkner at the age of 37 has had a meteoric rise to stardom, in fact he was immediately singled out as a name to watch after his first appearance at Salone Satellite in Milan in 2009. Given that is now a decade ago its not all that surprising that he was working on 28 projects in 2018. While his refined glass ‘Bell’ table for Classicon from 2012 proved his work had mass appeal he continues to work with a large number of small brands like Pulpo and Ames along side of the big names such as Moroso and Dedon. This year at Maison & Objet German brand Pulpo showed the exquisite ‘Grape’ table lamp, a tree-shaped lamp of intricately carved glass spheres. Herkner’s new work for Columbian brand Ames was also on display at Maison and this included a highly colourful outdoor chair called ‘Maraca’. Both Pulpo and Ames did the double and showed their products at both Maison & Objet and imm Cologne. 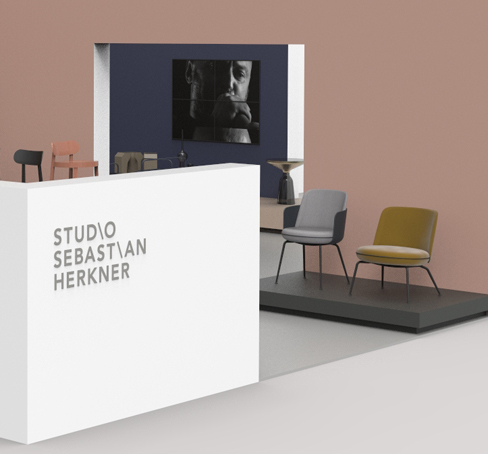 Maison & Objet created a video on Sebastian Herkner in preparation for the Designer of the Year event and this short film provides some insight into the designer’s process and his obvious love of craft. While Maison & Objet’s Rising Talents Awards in September 2018 focused on Lebanese designers, this January edition saw Maison & Objet turn to China. Frank Chou, Chen Furong, Mario Tsai, Hongjie Yang, Ximi Li and Chen Xingyu / Bentu were all chosen for their valuable contributions to the burgeoning Chinese design scene. 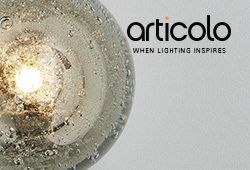 For a look at the work of all six of the chosen designers, go to the Maison & Objet website here. ‘Pin’ wall light by Chen Xingyu for Bentu. ‘Combo’ modular sofa by Frank Chou. ‘T-series’ lamps by Chen Furong for WUU. Well known Spanish rug brand Nanimarquina launched a new collection of outdoor rugs by Turkish designer Begüm Cana Özgür. ‘Shade’ comes in four colour palettes - all of which feature subtle colour shifts from one end of the rug to the other. Each palette comes in two sizes 170 x 240cm and 200 x 300cm and are made of hand loomed polyethylene fibre. These rugs join the ‘Tres’ outdoor collection released previously and a new chequered outdoor rug called Oaxaca - both designed by the founder of the company - Nani Marquina. Just a few days after the end of Maison & Objet, renown limited edition object gallery ToolsGalerie is opening a new show called The Art of Sitting with work by seventeen contemporary designers from all around the globe; Anna Aagaard Jensen (Denmark), Jean de Dieppe (France), Frédéric Ruyant (France), Philipp Aduatz (Austria), Sho Ota (Japan), Maarten Baas (Netherlands), Morten Stenbaek (Denmark), Cara/Davide (South Africa/Italy), Guillaume Delvingne (France), Stine Mikkelsen (Denmark), Yohan Viladrich (France), Bram Vanderbecke (Belgium), Boris Vian (France), Mario Minale (Italy), OS∆OOS (Netherlands), Schimmel & Schweikle (Germany), Rooms (Georgia) and Snarkitecture (USA). The focus is of course the chair - in all manner of forms. A small selection of the work is shown below. For more go to the ToolsGalerie website here. The exhibition runs from the 25th of January until the 26th February 2019. ‘RB02’ bench by Johan Viladrich from The Art of Sitting exhibition ToolsGalerie Paris. ‘Sculptural chairs’ by Rooms, from The Art of Sitting exhibition ToolsGalerie Paris. 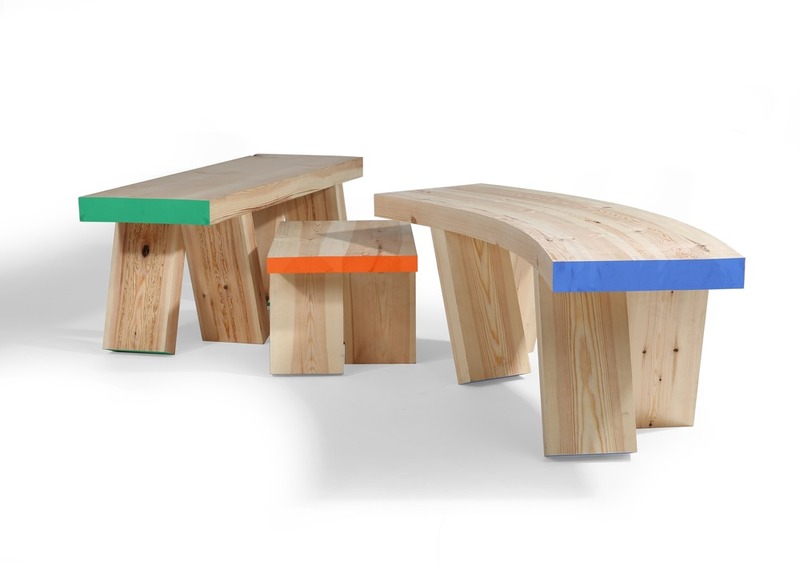 OS∆OOS ‘Tunnel’ stools from The Art of Sitting exhibition ToolsGalerie Paris. Rakumba took advantage of the fact that their star designers were selected to create Das Haus this year to make their second appearance at imm Cologne, launching additional new products from Studio Truly Truly’s ‘Typography’ lighting range to the European market. Beyond the Typography suspended system, they released a wonderful new floor light that offers genuine flexibility with inter-changable numbers of light sources and shade shapes. You can watch a short video on this ingenious lamp here. Part of Studio Truly Truly’s Das Haus installation showing their ‘Typography Rib’ chandelier for Rakumba. Past Das Haus designer Sebastian Herkner is an incredibly prolific creator and was in Cologne to launch a number of new products for companies Ames and Schonbuch. The outdoor ‘Maraca’ armchair (shown below left) combines a laid-back appearance with complex coloured fabrics reflecting the brand’s Columbian focus. The ‘Albert’ side table for German brand Schönbuch offers a refined industrial look with a delicate handle detail and stacked tray-like bands. Young Danish company Please Wait To Be Seated launched a new range of seating called ‘Anza’ by Portuguese /Japanese designers Rui Pereira and Ryosuke Fukusada. The seats appear like muffins rising out of a rigid base but are upholstered in a highly detailed fabric that appears to be based on a patchwork of Japanese Kimono fabrics. 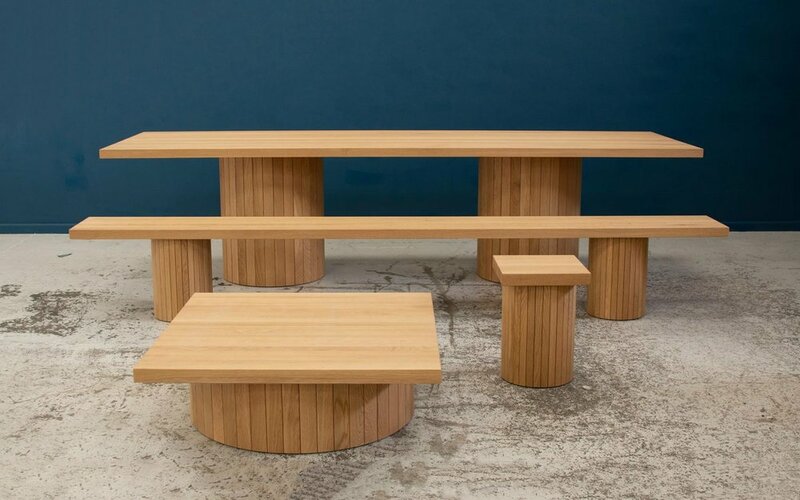 ‘Anza’ bench, stool and side table by Rui Pereira and Ryosuke Fukusada for Please Wait To Be Seated. 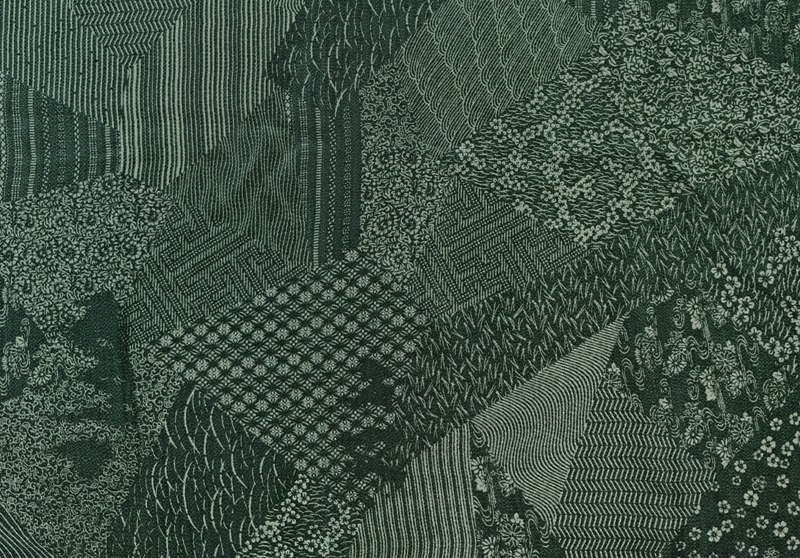 Rui Pereira and Ryosuke Fukusada’s ‘Anza 54’ pattern in cedar green. The Aero V open wardrobe by Shibuleru for Living Divani. Cassina was in attendance at imm Cologne promoting the recently reissued 279 Beugel chair designed by Gerrit T. Rietveld, the new table by Michael Anastassiades and the Mondo pendant light by Antonio Facco. 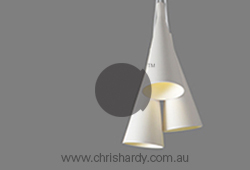 The pendant has four overlapping metal shades. The Artek stand at imm Cologne featured a new stacking chair design called ‘Atelier’ by TAF Studio. The chair is perfect for contract or hospitality but works well in a residential context too. 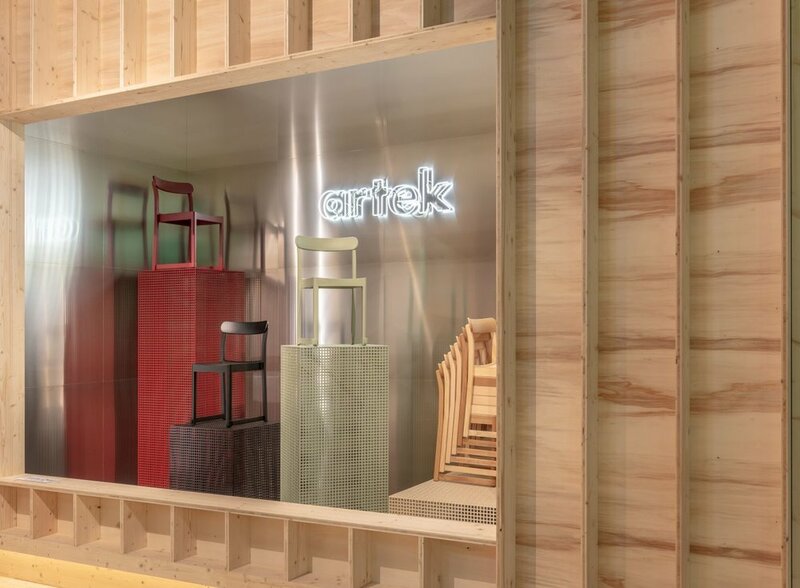 The Artek stand at imm Cologne 2019. Photograph: Roman Thomas. imm Cologne is well known as the furniture trade fair where deals are made and distribution contracts are signed. It’s therefore not all that surprising that many of the worlds biggest furniture brands were out in force including Minotti, Flexform and Cassina. Zanotta, who always presents an immaculate stand brimming with great product and sharp scenography was also there. Among the brand’s many post war classics were recent designs from Philippe Nigro, Ludovica+Roberto Paloma and Rodolfo Dordoni and along with a brand new glass table collection by M&O Designer of the Year Sebastian Herkner. ‘Echino’ uses fluted glass tubes in an array of translucent colours as legs, with a ultra-thin metal top. The design comes from Herkner’s obsession with glass but also from the fact that Herkner’s ‘Bell’ table in that material has been a mega-hit for Classicon. Part of the Zanotta stand at imm Cologne - perfectly executed as usual. 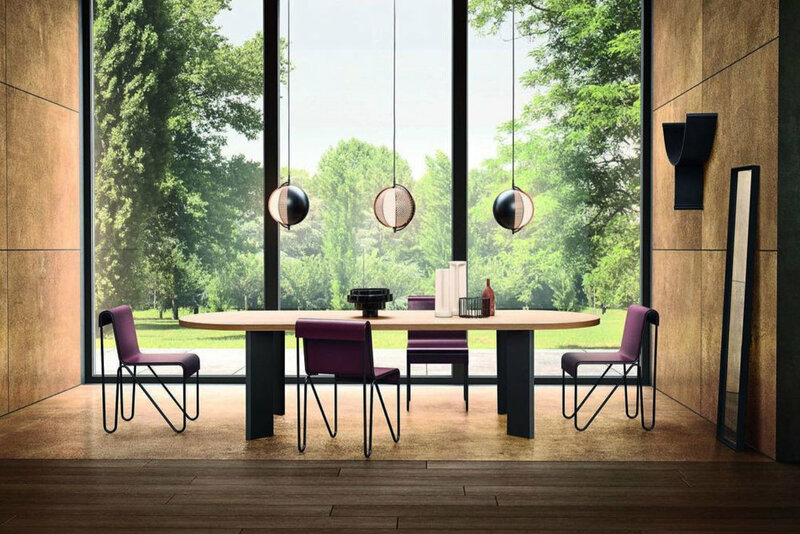 Seen here in the foreground are ‘Noli’ dining chairs by Ludovica + Paloma gathered around a ‘Tweed’ dining table by Garcia Cumini. Photograph: Patricia Parinejad. Sebastian Herkner’s ‘Echino’ side tables for Zanotta. The 100th anniversary of the Bauhaus is being celebrated in 2019 with exhibitions and many other events being held across Germany. To co-ordinate with this milestone, German brand Walter Knoll released a cabinet called ‘The Farns’, a largely translucent sideboard of glass whose name is a reference to Mies Van der Rohe’s famous Farnsworth House in Illinois. ‘The Farns’ cabinet in timber and glass by Austrian designers Eoos for Walter Knoll references Mies Van der Rohe’s iconic Farnsworth House. Specialist glass brand Wonderglass revealed the start of a new collection designed by Oki Sato of Nendo. The ‘Melt’ chair is the first piece but additional furniture elements from the collection will be launched at Salone del Mobile in April in the context of a special installation by Nendo. Oki Sato of Nendo with his slab glass ‘Melt’ chair for Wonderglass. The Kvadrat stand at imm Cologne designed by GamFratesi celebrated colour and fabric in a beautiful way. German brand Pulpo launched a number of new lighting products by Sebastian Herkner and Ferréol Babin and no-made studio as part of its ‘Light Now, Vol. I’ collection. 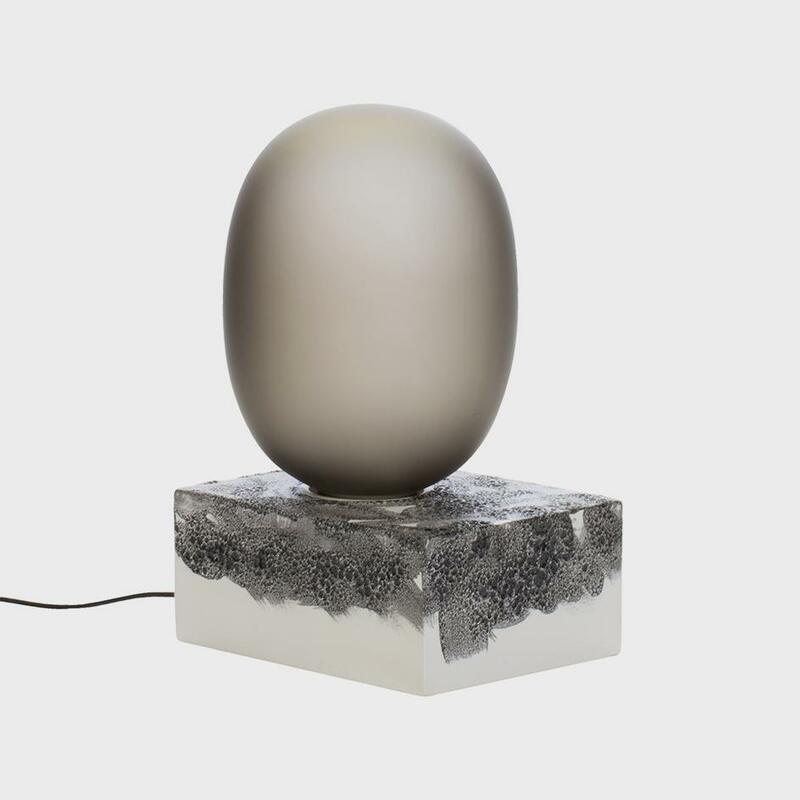 The ‘Magma’ table lamp (shown below left) by Babin, uses lava fused with ceramic as a base with an egg shaped glass shade balanced on top. The ‘Grape’ table lamp by Herkner can be seen earlier in this post as part of the Maison & Objet highlights and groups delicate spheres of cut glass off a metal stem - like branches on a tree. Shown right is a new ceiling fitting called Berlin 720 by Christophe Pillet for Italian lifting specialist Oluce. The young designer competition Pure Talents at imm Cologne, was held for the sixteenth time in 2019. Creatives from 69 countries submitted 926 products from which the jury had the unenviable task of reducing to a more manageable number to be included in the exhibition. 26 products were finally selected to be recognised and displayed as part of the exhibition. The competition is aimed at students and recent graduates and is a wonderful platform for emerging designers to show their work to a global audience, most of whom are industry professionals. ‘Axis’ light by Gal Bulka. Shortlisted as part of the Pure Talents Award imm Cologne 2019. ‘Bench Gang’ by Christian Cowper. 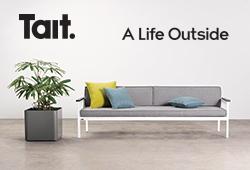 Part of the Pure Talents competition at imm Cologne 2019. Cowper won second prize for his entry. ‘A day at the zoo’ by Julian Marticke. This design was part of the Pure Talents contest at imm Cologne 2019. Marticke won 3rd price with his entry. The Baschnja light by Ilja HuberIlja Huber. Part of the shortlisted entries for Pure Talents imm Cologne 2019. Huber won 1st prize for his entry. 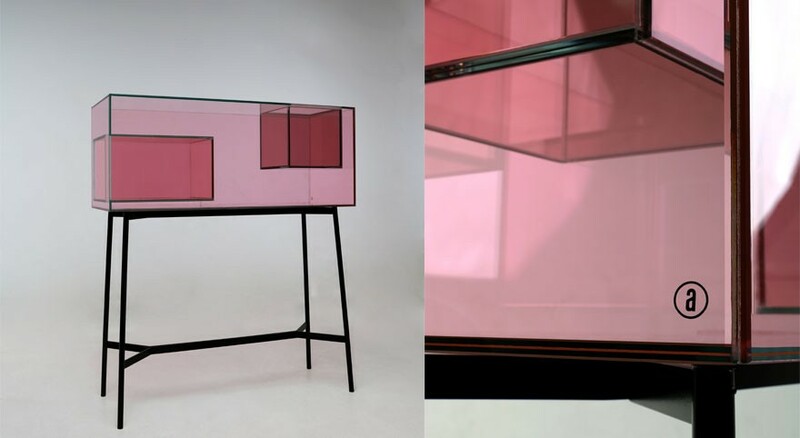 Ablehne Reschke’s ‘Floating Boxes’ display cabinet in rose coloured glass. Reschke was shortlisted in the Pure Talents competition at imm Cologne 2019. A special mention went to : Michael Varga.